I've been getting familiar with Vector 35's Binary Ninja. It's an incredible, affordable, cross-platform static analysis toolkit for binaries. 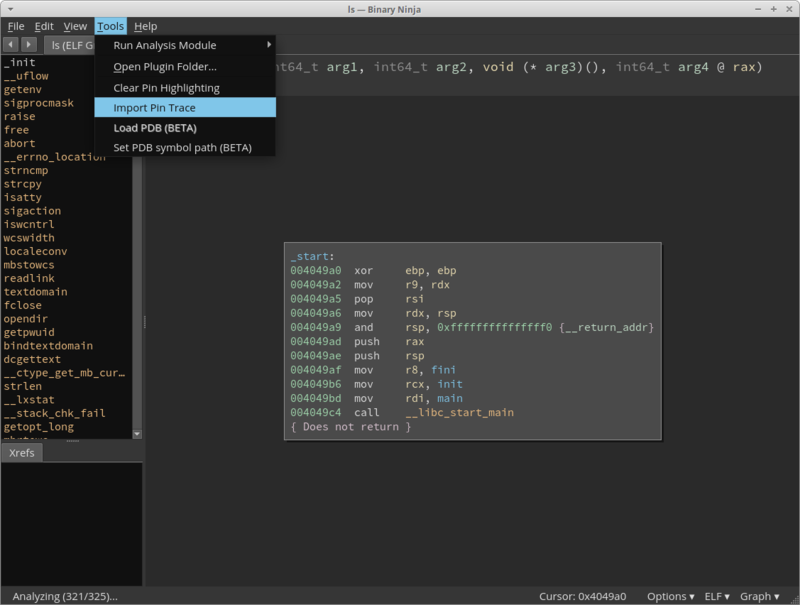 Binary Ninja also has an intuitive Python API, which you will see soon. Pin is Intel's dynamic binary instrumentation toolkit. 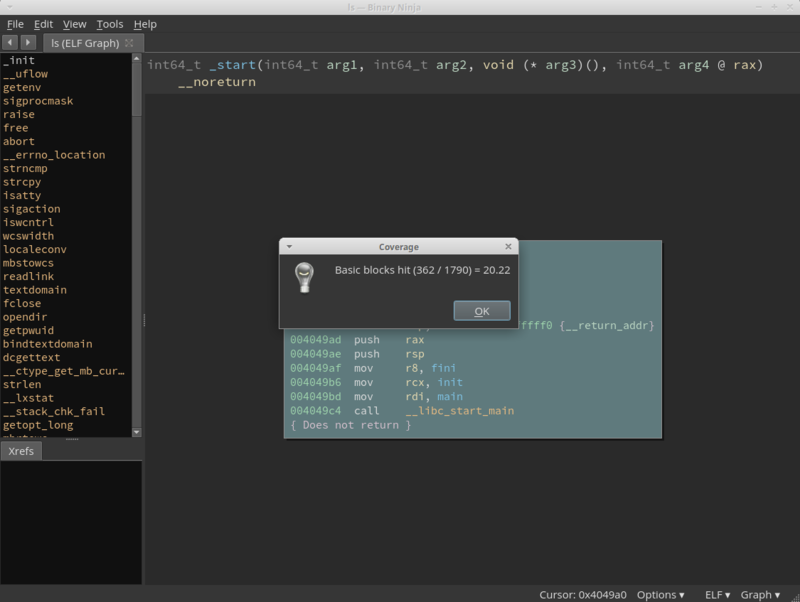 It allows you to easily write your own plugins in C++ for dynamically instrumenting code on the fly. I've decided to use this tool in conjunction with Binary Ninja to provide visual code coverage for test cases, or for quickly identifying dead code paths. This has been an over simplification of both Binary Ninja, and Pin. You should check them both out, and see if they are right for you. I am not an expert in either of these tools, and this has been my first endeavor writing plugins for either of them. As such, if you see something wrong, then please submit a pull request. This whole process has been a learning experience, and I'm always down to sharpen the toolkit. This was all done on a Linux based system. First, go ahead and download + extract the Pin toolkit. You'll want to place the path where it's been extracted into your $PATH variable. Inside of the pin directory you will see source/tools. This is where the plugins that are shipped with Pin. You can compile them individually, and play around with their functionality. A typical execution will look like the following, which will execute /bin/ls with the desired instrumentation. Go ahead and grab a copy of BasicBlocks from github. BasicBlocks is a pin tool written for this Binary Ninja plugin. It prints the address of each basic block that is executed. 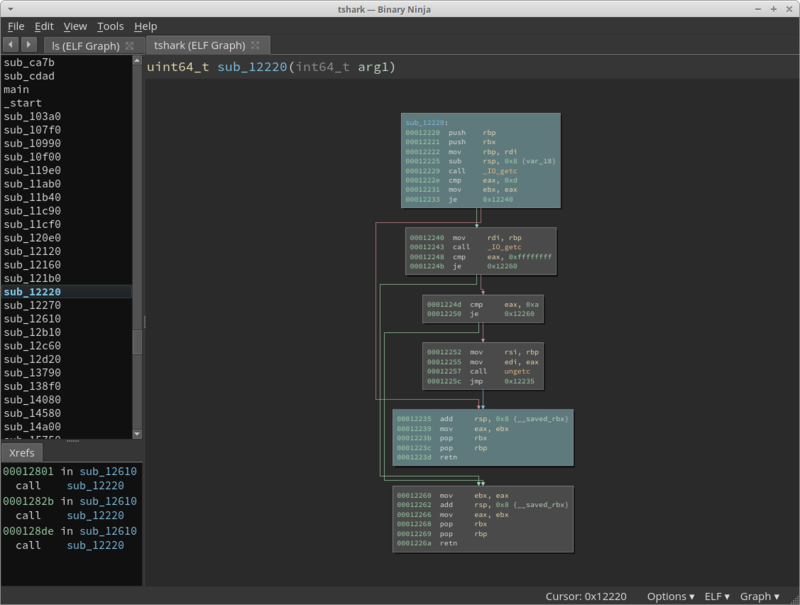 We'll import this data later into Binary Ninja, in order to get a visual analysis of code coverage. The plugin directory is generally stored in ~/.binaryninja/plugins on Linux based systems. Go ahead and clone the plugin into that directory. Now, you can fire up Binary Ninja, and two menu items will be added under the Tool menu. Go ahead and open /bin/ls. If you haven't generated a basic block trace, go ahead and run the pin command shown above. Our next step will be to import it into Binary Ninja. If the binary is compiled as a Position Independent Executable (PIE), the plugin will attempt to calculate the slide from the initial Basic Block to the program's entry point. This has so far been successful on x86_64 Linux using both tcpdump, and tshark as examples. Below is a screenshot from tshark with PIE enabled, and a Basic Block trace using the pcap testcase that ships with AFL. CloudFlare is a complete solution offering Content Deliver Network (CDN) style capabilities along with Web Application Firewalls (WAF). It's also a market leading solution for Distributed Denial of Service (DDoS) mitigation for websites. CloudFlare works by placing its server arrays in front of a website and determines whether or not to allow traffic to pass through. For a more detailed listing of capabilities, please read CloudFlare's own Blog. In order for the system to remain effective, all traffic must pass through the CloudFlare network. If we are able to directly connect to end systems, we can often bypass the WAF or target specific systems for traffic shaping or DoS attacks. There has been some effort in the past to unmask servers hiding behind CloudFlare. One website in particular maintains a database of IPs that appear to have been exposed. Not all of their techniques are public, and there appears to be a large gap in most of their data. Many have also used historical DNS records to track previously exposed systems. Forcing a server to send an e-mail for user registration or mailing lists can also expose backend infrastructure. These techniques also create some gaps, and you may only be able to find an IP or two that is still relevant. When you use CloudFlare to front your website, an SSL/TLS certificate is automatically registered by CloudFlare for your domain. This means that traffic going to your site is initially encrypted when it hits CloudFlare's servers. From there, traffic may very well be in plain text back to your server. Many sites opt to have their own certificates to protect the second half of the transaction. In order to maintain a trusted certificate, you must prove to some level of degree that you are the owner of a domain. This burden of proof, and trust mechanism makes it easy to associate true server IPs to CloudFlare protected domains. By utilizing large data sets that have been scraped from the Internet, it's possible to find non-CloudFlare servers by associating previously generated certificates with live hosts. Censys.io is a great resource that relies on data sets from Scans.io. Both are incredible repositories of information that have been gathered by scanning the Internet at regular intervals. There are multiple types of scans from dns and ftp to http/https scans of all public IPv4 space. Censys has graciously offered a public API for researchers to use. We are going to use the scraped certificates from across the Internet to identify potential servers hiding behind CloudFlare. You'll need to utilize your API credentials after registering with Censys. These can be found under My Account. The only Python requirement is censys's maintained PIP package. I downloaded a top million list of domains from Statvoo. From there, I extracted the top 50k domain names, and ran scans to see which domains were using cloudflare. I stopped the scanning once the list was close to 9000 (9038). I then modified the cloudsnare script to add a soft form of rate-limiting. The numbers are not exact, as I did hit a few exceptions here and there in the script, but I was able to observe at least 1842 domains that leak some sort of IP address based on public certificate data. That's right at ~20% of top domains being affected. Note: I did not go through and check every domain for types of systems exposed, or weed out any false positives. CloudFlare has a great blog post about keeping your IP space private. You should restrict inbound traffic to your HTTP/HTTPs ports, and only allow connections from CloudFlare IPs. If you are worried about CloudFlare changing IP space, you can use your host's default domain while registering certificates. For instance in AWS, you might have an issued domain from your service provider similar to ec2-54-78-80-22.us-west-2.compute.amazonaws.com. Traffic will still be encrypted between your host and CloudFlare, but won't expose any of your systems to this technique. After bookmarking and constantly referencing the correct format for various types of reverse shell one-liners from Pentstmonkey, I decided to write a quick helper script for generating the correct code along with automatically filling in the IP address. Simply replace the interface variable with the name of the interface you conduct your penetration tests on and spawn your netcat listener. This is part 2 of hunting Red Team C2 Infrastructure. Part 1 covered finding Empire C2 end points. In this post, we will show how to do the same for Meterpreter. There were no immediate crashing bugs found in the Meterpreter HTTP/S handler, but there is still enough information to profile these end points. Meterpreter is an advanced C2 infrastructure often used as a payload with the popular Metasploit exploit framework. It's cross-platform and highly extensible. In this post, we will focus on finding the reverse HTTP/S handlers for Meterpreter. Using the HTTP request of GET / HTTP/1.0, the following headers were returned. Shodan is a search engine for Security Researchers. They routinely scan common ports across the Internet, and make the data publicly available, and easily searchable. APIs are also provided for automating a lot of the tasks required. Using the common headers, and default web page listed above, we are able to narrow down the list of possible Meterpreter C2 node candidates on the Internet with a simple query. You'll notice that the results returned all are HTTP/1.1 with matching profiles that we scoped out above. Another characteristic that makes Meterpreter listeners easy to identify, is that all requests that aren't to the backend result in the same response. Random URLs will get the same response as grabbing the index. Legitimate servers will typically produce a 404 error. There's no excuse for leaving your C2 node exposed to the entire Internet. Use whitelisting of IP space in order to keep your tests in scope, and avoid having other people attack your nodes. In order to change the default server and page discussed above, these are all part of the advanced settings. In case there are any questions about the servers found being Meterpreter listeners, the following is a valid URI that will download Stage1 of the Meterpreter session from any given reverse HTTP/S listener. As we discussed in part 1, we can use Scans.io data in order to get a broader search of HTTPS servers. If you still have a copy of the data, you can run a zgrep search like the following to identify possible C2 nodes from this data. This may take several minutes to run, as the datasets are generally several gigabytes in size. The result will be a file containing JSON data for each host that returned the default Meterpreter HTML. You can parse this file and extract each IP address that should be tested.